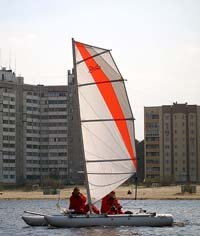 Ducky 15 is a very popular model from the Ducky catamaran family. In spite of its small size, this is a full-fledged sailing catamaran which in a fresh wind can give you as much adrenalin as you desire. Very easy to control, it's perfectly suited for recreation as well as week-end cruises. Such a catamaran could also be rented out at a beach. Even a beginner would have no problem with controls. The assembly of this catamaran won't wear you out when departing for a day cruise. The distinctive feature of this catamaran's frame is the minimal number of cables and rigid elements which provide the required load-bearing capacity. Because of the simplicity of its design the catamaran can be assembled within 45 minutes. Assembly requires no tools. 1.95 x 0.3 x 0.25 m.
0.8 x 0.4 x 0.3 m.